Chandlers Wharf is a very unique Portland condo community built on the piers in Portland Harbor. They were built in the late 1980s and occupy a unique vantage point, with unabridged views of the shipping channel and the inner working harbor. Chandlers Wharf entrance is located right on Commercial St., in the heart of the Old Port close to all of Portland's restaurants and attractions. MAP VIEW . It is gated, protected, and offers the convenience of deeded parking below the units. positioned to allow for a short stroll to all of Portland's restaurants and shops in the Old Port which Portland is famous for. Most of the Chandlers Wharf units are three story town homes which are approximately 1700-1800 square feet and have balconies on either the shipping channel side or the inner harbor side. The entrances open onto a long flight of stairs that lead to a second floor which has the living room/kitchen/balcony. The next floor has two bedrooms and bath with a circular staircase to a loft with skylights and views. The most spectacular units are the ones located at the end of the piers. Some slips for yachts are available that are deeded but can be transferred separately from the units. There are also one level Chandlers Wharf units which are smaller but offer a unique advantage of having no stairs. They are lovely and usually offer very long balconies because of their width. 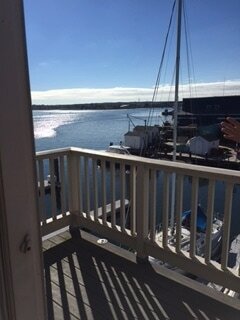 My clients on Chandlers Wharf frequently wake up to the sound of the lobster boats and the cry of the gulls. 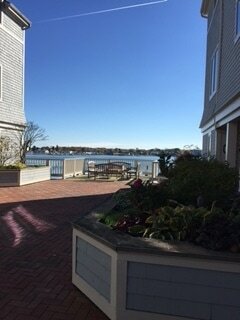 It is a unique Maine condo community in the heart of Portland Harbor and the heart of the city.